Spring is in the air, and with longer days and warmer temperatures right around the corner, I really begin to crave healthy meals, and I look for creative ways to bring more produce to our dinner table. One of my favorite spring meals is a hearty salad full of flavor, loads of texture, and healthy ingredients. I wasn't a big salad eater as a child, but, there was one salad that I always craved, and that was the classic Chinese chicken chopped salad with plain poached chicken and those canned mandarin orange bits. Now, as an adult, I prefer fresh and wholesome ingredients, and bold flavors, so I've developed a tasty twist on this classic salad, in partnership with Earthbound Farm and The Feed Feed. I am thrilled to be teaming up with Earthbound Farm to introduce you to their new line of salad kits. 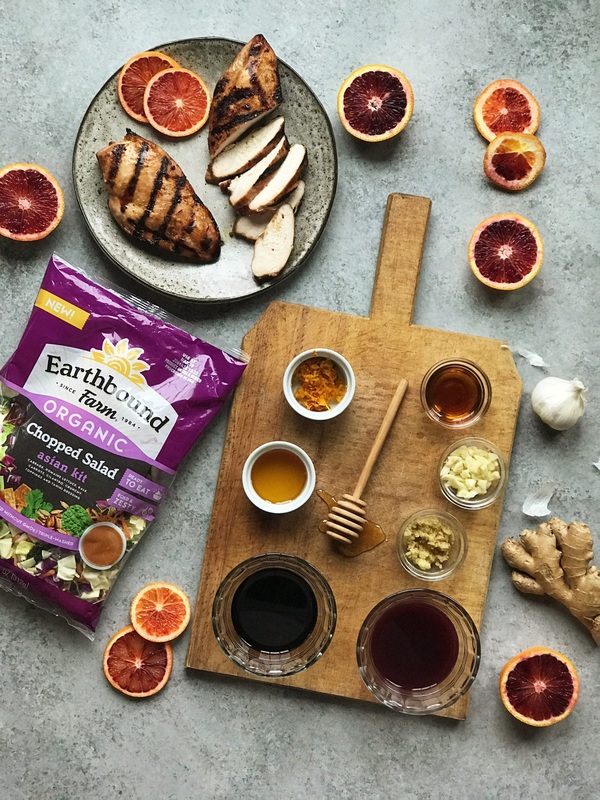 Earthbound Farm is committed to sustainable farming which means that the produce you find in every one of their salad kits is 100% certified organic produce. As a parent, I feel good knowing that I'm serving my family wholesome, real food that is so delicious too! Earthbound Farm Organic Chopped Salad Kits come in several great flavors, like Southwest and BBQ Ranch. For my recipe, I'm using their Asian Chopped Salad kit. 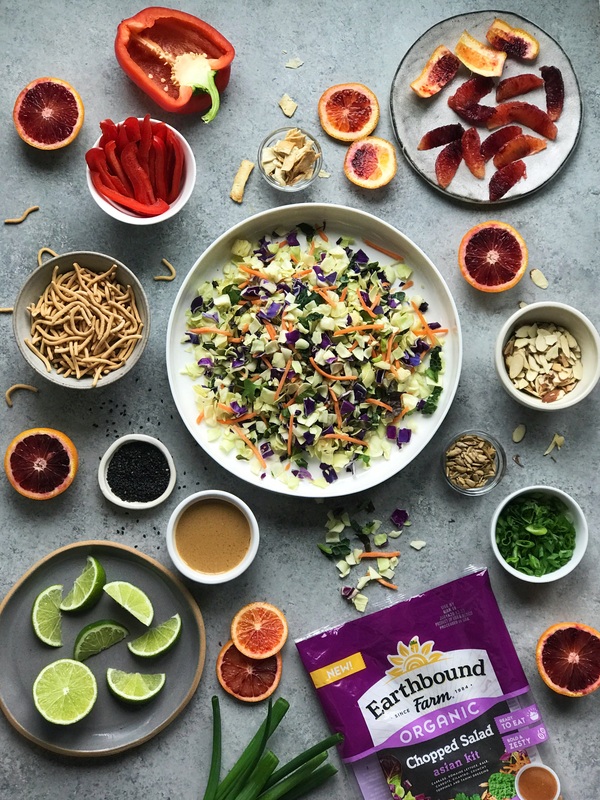 Earthbound Farm Organic Asian Chopped Salad kit is completely ready to eat on its own and makes for a great starter or side dish. Their Asian salad kit contains chopped cabbage, romaine, kale, carrots and cilantro and comes with sunflower seeds, wonton strips, and a delicious tangy tahini dressing. The dressing is so fantastic that I hope someday they bottle it and sell it in big sizes! I love that the kits are triple washed and that all the ingredients are already chopped up as this cuts down on prep time and makes putting this salad directly on the table a breeze! These salad kits are fantastic on their own, and, when paired with a protein, you can turn them into a complete meal! Now, back to this recipe that I'm incredibly excited to share with you! This salad is so good that my family keeps asking me to make it again and again! Anyone who knows me knows that I love blood oranges, so, I have incorporated them in both the marinade and the salad. The chicken is so flavorful after marinating overnight in the blood orange juice and zest, ginger, soy, honey and garlic, that after it came off the grill, I kept sneaking pieces to eat right off the cutting board. 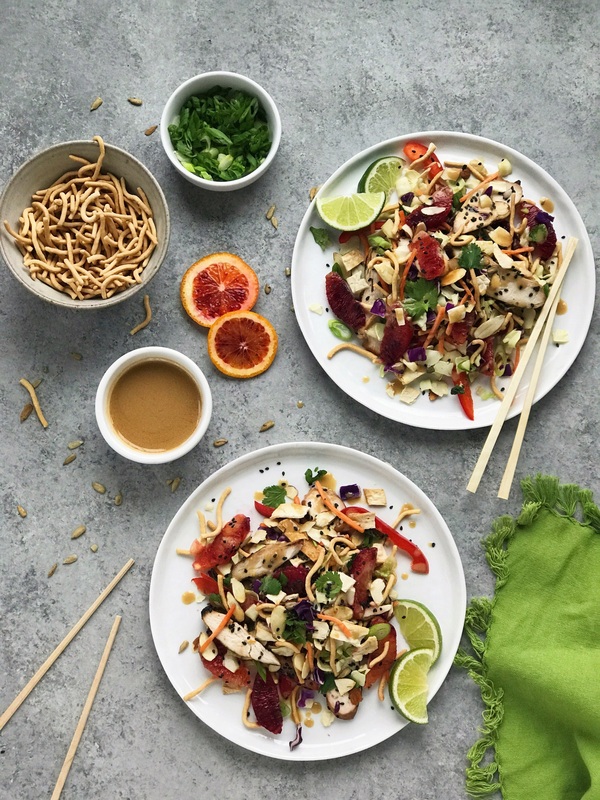 To make this an Asian chopped salad I added strips of sweet crisp red bell pepper, wedges of juicy blood oranges, crunchy chow mein noodles, bright green onions, toasted almonds which give it a nice nutty flavor, and black sesame seeds. This is a salad that has so many great textures and flavors that pair perfectly together. I hope you try the recipe! While I used the Asian variety in this recipe, be sure to also check out their BBQ Ranch and Southwest Chopped Salad Kits as well! In a large resealable bag combine soy sauce, blood orange juice and zest, ginger, garlic, honey, sesame seed oil. Stir until well-mixed and then add chicken breasts, seal bag, and marinade overnight or for a minimum of 2-3 hours. Remove the chicken breasts from the bag, discard the marinade, and grill the chicken for 5-7 minutes per side or until internal temperature reaches 160° to 165° F. Let the chicken rest for 10 minutes. Cut the chicken into bite size strips. Cut red peppers, green onions, and segment your oranges. To segment an orange, cut off both ends of the orange, stand it upright on your cutting board, and then slice away the peel. Then, with a sharp knife, go in between the orange sections and cut the wedges out. Note, if blood oranges aren't in season, just substitute another type of orange. To toast the almonds just put them in a hot dry skillet and keep moving them for about 2-3 minutes until they just begin to get a touch of color. Place Earthbound Farm Organic Asian Chopped Salad vegetables directly in a large salad bowl. Add all the sliced chicken, blood orange segments, chow mein noodles, almond slices, red pepper slices, green onions, sesame seeds, Earthbound Farm Asian salad kit sunflower seeds and wonton crispy toppings, and mix. Drizzle tahini dressing over the top and squeeze a bit of fresh lime juice over the top. I like adding the lime juice as blood oranges are sweet, and this brings in just a touch of tartness. Serve in bowls or on plates with an extra lime wedge and enjoy! Such an easy, fresh, bright, and flavorful salad that all starts thanks to Earthbound Farm!